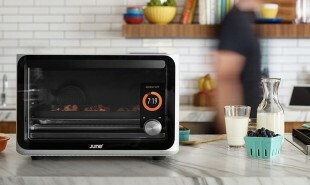 For those who just can’t get their heads around the intricacies of home cooking, June is a smart countertop oven which can automatically program itself to cook the food put inside it. June uses a digital camera, food recognition technology, an in-built digital scale, thermometer and Nvidia processors to recognize the raw ingredients and work out how to cook them, adjusting oven temperature and cooking time accordingly. June was created by Nikhil Bhogal and Matt Van Horn — former employees of Apple — and boasts a 1.0 cubic foot capacity. It can be used for baking, roasting, broiling, toasting, and slow cooking — anything from elaborate roasts to oven pizza. 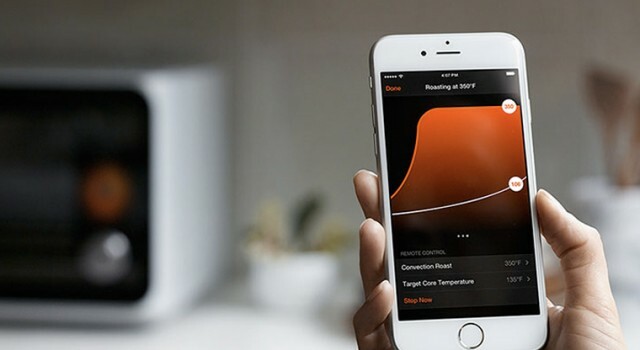 The smart oven is accompanied by an app which enables users to monitor their meal via their smartphone and adjust temperature or cooking time remotely. It uses carbon fiber heating, advanced insulation and convection fans to ensure maximum efficiency. June is currently available to pre-order for USD 1,495 — buyers are required to place a USD 95 deposit and pay the balance when the first shipments are sent out in 2016. The price will rise to USD 2,995 next month.